The room was clean and comfortable and the location was very convenient! It would be good to have some sheer curtains on the windows for privacy without having to close the actual curtains. A no smoking rule would be great. Great views of the coast and close to everything . Love the location. Right on the water. 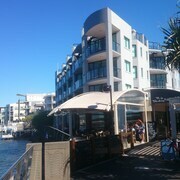 Walking distance from great beaches and shops. Family friendly, tidy and clean older property. Friendly and helpful staff. Kids loved the heated pool and spa. Great location and facilities. Lovely room overlooking the tennis court. Plenty of kitchen utensils and the room was very clean. 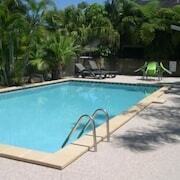 The location is perfect, one block to the beach and one block from the main street. The reception staff were very friendly and helpful. I just wish we could have stayed longer. 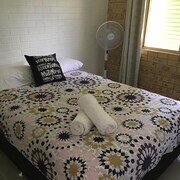 Visiting Caloundra and need somewhere to crash? You'll find a sweet hotel room on lastminute.com.au. If our deals were on a dating app, you'd be swiping right on every one of them! You don't have to stay anywhere else but in the thick of the action. There's an impressive 52 hotels within 2 kilometres of the centre just waiting for you to get your hands on. 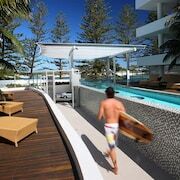 Alleviate your sense of FOMO and look into the vibe at the Aspect Caloundra and the Rumba Beach Resort. They're both right in central Caloundra. You could also check out the Sails Resort on Golden Beach and the Gemini Resort. 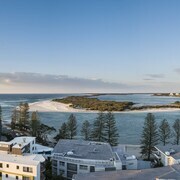 The neighbourhood of Kings Beach is 1 kilometre from the middle of Caloundra, and offers 17 hotel options. The Rolling Surf Resort and ULTIQA Shearwater Resort are all recommended options. At Shelly Beach, the shores and salty ocean air await. So pack yours thongs, and take off to enjoy the atmosphere. The Monaco and Portobello By The Sea should be well up on your hotel hit list if you don't want to travel far to see it. Recharge your soul when you spend some time at Moffat Beach. Bring the whole family, and enjoy the fresh sea air! Pumicestone Blue and BreakFree Grand Pacific Resort are two nearby hotels if you don't want to stay miles away. After more options? The Oceans Mooloolaba is positioned 14 kilometres away from the downtown area, and the Spicers Tamarind Retreat is 25 kilometres away. The Narrows Escape Rainforest Retreat, 30 kilometres away, and the Spicers Clovelly Estate, 25 kilometres away, are some further alternatives. It's well known that Aussies are pretty relaxed, so consider chilling out a little longer and going to the Dickey Beach and Point Cartwright in Parrearra, 10 kilometres to the north of Caloundra. 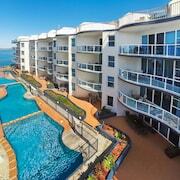 Some of our recommended Parrearra hotel options are the Raffles Mooloolaba and Sailport Mooloolaba Apartments. 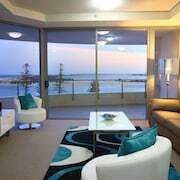 Alternatively, you could stay in Sippy Downs, 12 kilometres to the northwest of Caloundra, where you can choose from the Grand Palais Beachside Resort and BreakFree Alexandra Beach. If you stay in Sippy Downs, set aside a little time to check out Kawana Beach and Mooloolaba Beach. Sick of trying to nod off upright? Dreaming of a cosy pillow? Then pick up a room at the Novotel Brisbane Airport. 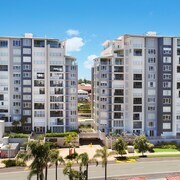 It's within an easy drive of Brisbane Airport, which is 65 kilometres from Caloundra's centre.